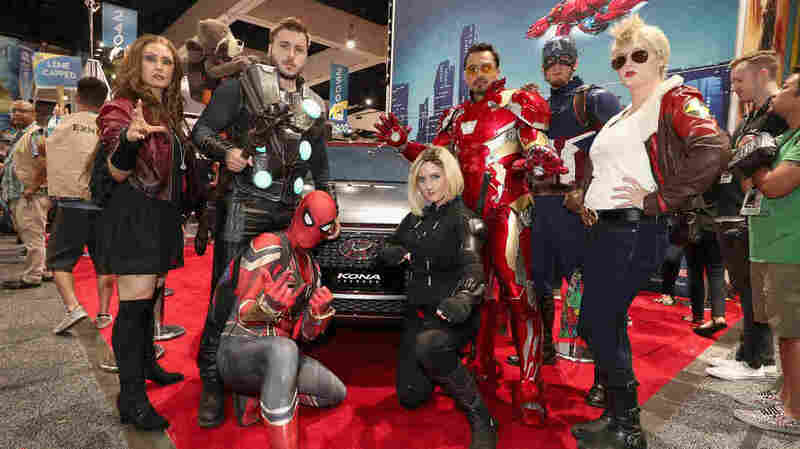 Comic-Con Day 3: The Best Hawkeye On their third day at San Diego Comic-Con, NPR's Mallory Yu and Petra Mayer get into the spirit of things by dressing up as their favorite heroes and checking out the amazing costumes on display. When we saw this crew, we were impressed — and also curious about how long you can stay in an Iron Man suit that realistic. Today is cosplay day! As the con goes along, people start busting out better and better costumes, and we spent a few hours today seeing the extremely impressive sights. Oh, and did we mention — WE were part of those sights? 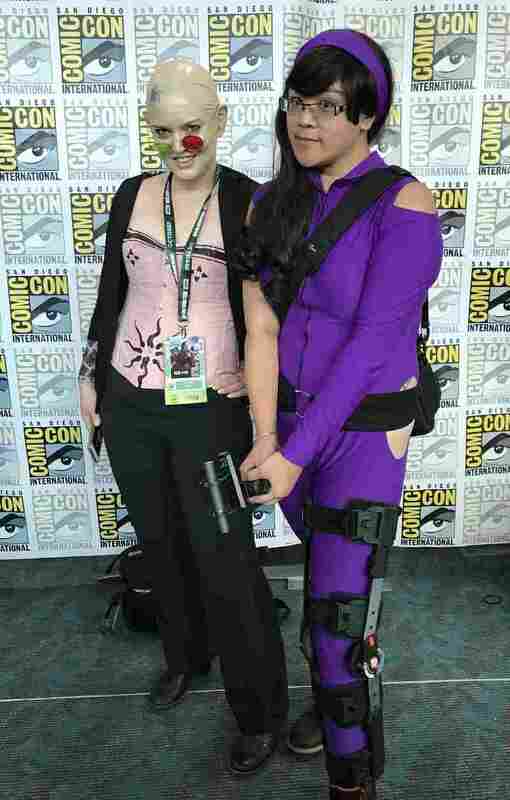 Mallory dressed up as the Kate Bishop version of Hawkeye, from the Young Avengers, acknowledged by many people who saw her to be the BEST Hawkeye. And I was Spider Jerusalem from Transmetropolitan — a hero to journalists everywhere. We sat down behind the convention center at San Diego Comic-Con to talk about our favorite outfits. 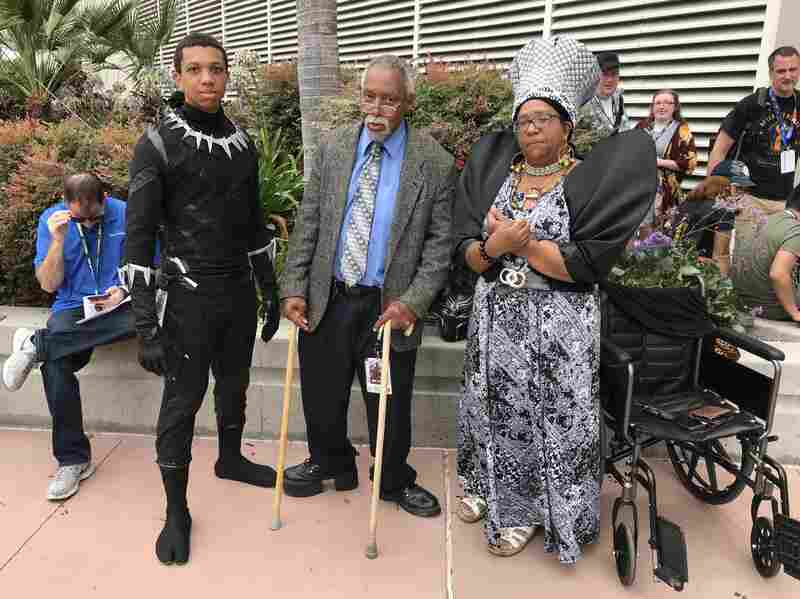 Myin Jones and his parents as the Black Panther, King T'Chaka and Queen Ramonda. Mallory: So far my favorite thing that I've seen are the families that have been playing. We ran into three parent-child combinations, which is always really fun to see — one of them was King Arthur from Monty Python, and her father was the little man with the coconuts behind him. Another family was Poseidon and his wife and daughter, and we just ran into this incredible Black Panther cosplay, with his mother and father, King T'Chaka, which was really cool. Petra: And when we asked them for their names, his father kept saying T'Chaka — we couldn't get him to give us his real name. Mallory: Myin Jones, who was dressed as Black Panther, was saying that he and his family always dress up together. But this was the first time that they've been able to do, like, a father-mother-son-sister cosplay — his sister was Shuri, but she's at work today, so we don't have a photo of her. Petra: We've seen a lot of group cosplays. We've seen a lot of Game of Thrones group cosplay, some Star Wars. Mallory: We saw that really great Avengers cosplay with an actual Iron Man. And I wanted to ask him how long he can stay in that [costume], because I think I would get really claustrophobic after a while. Petra: I think my favorite was — I haven't seen a whole lot of Steven Universe but we did run across a Lapis and a Peridot. And if you know the show, Lapis and Peridot are partners — they live together in a barn. And as we were talking to them, a second Peridot snuck up and then they started yelling "Clod!" at each other, which is Peridot's catchphrase. And it was delightfully full of mayhem. It really does make you feel badass to be in a costume. You're like, I'm Kate Bishop, I'm the best archer in the world. I'm better than that other guy in the Avengers. So I can take on anything. Mallory: I think that's kind of the best part about being in cosplay, is that you see someone in cosplay and even if you don't know what that is, you automatically know ... you are nerdy in a similar way that I am, and I love that you've put thought and work into this costume, which is the great thing about cosplay, anyone — anyone — can do it if they really wanted to. Petra: Or in my case, earlier I ran across somebody in the same cosplay as I was, and I was so excited because this is a weird, obscure character from a '90s comic that not many people will remember, and that to me also was something that I love about cosplay. You always see Stormtroopers ... you know we see a lot of Deadpools; this year we've seen a fair number of Thors. But there's always those people that are clearly doing something that has personal meaning to them, even though it's not part of the zeitgeist. I saw two fembots from Austin Powers — they had the fluffy bras with the gun turrets, and it was so great — I was like, you guys have a passion and you're following it. You know you want to see our outfits â just like you know Kate Bishop is the best Hawkeye. Mallory: Yeah, and you know, sometimes someone might not recognize who you are, but then they see something else, and that kind of dawn of recognition on their faces is always really fun. I'm here with my girlfriend, and we're dressed as AmeriKate — [she's] America Chavez, who's also in the Young Avengers with Kate. They kind of have this flirtation ... we're in a couples' cosplay, and last night, we had this interaction at a party where someone saw my girlfriend and said, "Oh, are you America? I love your costume!" And then she saw me, and went, "Oh my gosh, Kate! Is this an AmeriKate situation?" And that was really fun. Petra: It occurred to me that cosplay and fanfiction are really related, because they're both ways of imagining yourself into the world that you want to be. Mallory: I also think that cosplay can be, for me at least, a real confidence booster. I'm wearing, like a spandex jumpsuit with hip cutouts and wandering around this convention, and like two years ago I would never have done that, because I wouldn't have felt comfortable in what I looked like ... and it really does make you feel badass to be in a costume. You're like, I'm Kate Bishop, I'm the best archer in the world. I'm better than that other guy in the Avengers. So I can take on anything.